06 Assistant Librarian Posts in DME Telangana: Telangana State Public Service Commission (TSPSC), Hyderabad issued TSPSC Assistant Librarian Recruitment 2018 Notification (Advt. No. 03/2018) for the recruitment of 06 Assistant Librarian posts in Directorate of Medical Education (DME), Telangana State. Eligible candidates can apply online through tspsc.gov.in from 29.01.2018 to 28.02.2018. TSPSC Recruitment 2018 : Latest announcement for the candidates who are waiting for the Govt Jobs in Telangana. The news is that, the Telangana Public Service Commission has published the latest TSPSC Notification 2018. TSPSC has invited the candidates to fill Vacancies for the Assistant Librarian Posts. Interested candidates who meet the eligibility criteria can start applying for this latest TSPSC Recruitment. The TSPSC Apply online link is available on the official website at http://tspsc.gov.in. Applicants can apply for this TSPSC Jobs Before Last Date. Check the eligibility criteria for TSPSC Vacancies and more information from below. TSPSC Notification 2018 is released. Educational qualification of this Recruitment depends on upon their qualification; their qualification depends upon the designated post. Application fee and age limit also depends on upon the post; please verify such details in the official notification. This is a good chance for the applicants, so don’t miss the chance. They had released many recruitments in various categories, so there is the chance for very applicants, please try for it. To apply online, you have to complete your one time registration process. If you are already registered in the exams no need of registering again, if not you has to give your details in the registration process to complete your registration. 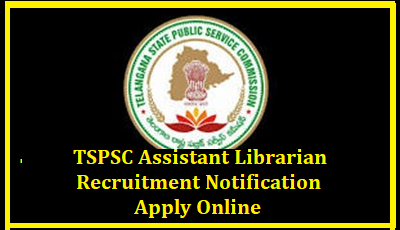 To register in this TSPSC Assistant Librarian Apply online please visit official website http://tspsc.gov.in. Here we had given more information about TSPSC Recruitment 2018. Eligible candidates can apply online through tspsc.gov.in from 29.01.2018 to 28.02.2018. Candidates should complete the OTR process before applying online. Candidates required to pay requisite Application Processing Fee and Examination Fee. SC/ ST/ BC/ Unemployed applicants, PwD, Ex-SM candidates are exempted from payment of Examination Fee.